Model-makers around the world have been getting a lot more interested in Japanese armor after Dragon released its 1/35 scale kit of the Type 97 “Chi-Ha”. That kit received a chorus of approval and so Dragon is expanding its range of Japanese AFVs. 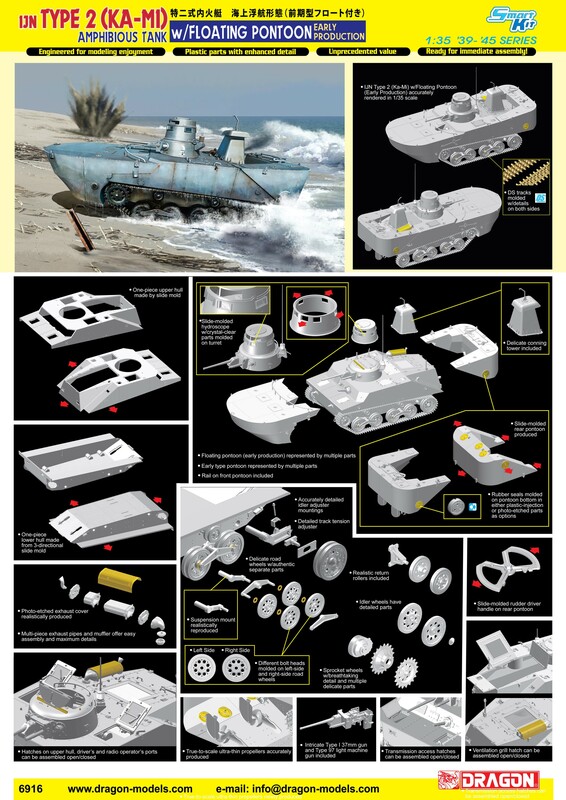 The newest addition is a 1/35 scale Smart Kit of the Type 2 “Ka-Mi” amphibious tank that depicts a tank with early-production pontoon, a single-piece front pontoon whereas the later type’s was formed from two halves. Other components such as the conning tower, rudder and hydroscope are fully detailed too. There’s widespread use of slide molds to create crisp detail. It also features detailed and easy-to-assemble DS tracks. This Type 2 “Ka-Mi” Early-Production amphibious tank with pontoons is a unique vehicle platform emanating from the Pacific theater of war. As another Japanese AFV available to meet growing demand, it’s certainly a timely release for modelers.